Toyota Prius Battery Replacement Cost - You Won't Like It! Toyota Prius Battery Replacement Cost – You Won’t Like It! Home/Toyota Electric/Toyota Prius Battery Replacement Cost – You Won’t Like It! 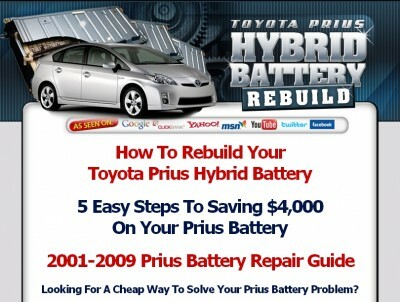 Do you want to know the Toyota Prius battery replacement price? The answer is…expensive! If you drive a new Toyota Prius model, having to get the battery pack replaced may not be a problem. In actual fact, the batteries in the Prius will last up to 100,000 miles or 8 years for whichever comes first. But why would you need to replace the battery pack of the Toyota Prius? One of the biggest causes is accidents. Even though you are driving a hybrid car, you will get into an accident if you are not careful on the road. If you are unlucky enough to crash your Prius, the battery casing may crack and you have to get it replaced. The cost of getting a new Toyota Prius battery system varies. The price to get a replacement battery for the first generation Prius ranges from $2500 upwards. If the replacement involves major reconstruction on the support structure, you may have to spend as much as $4000 to get it replaced. Luckily, there is a steady supply of High Voltage nickel-metal hydride battery packs for the Prius. These batteries usually come from wreck vehicles which you can get for $1000 or below depending on its condition. A used battery usually is not in the best condition and it will have reduced power, thus affecting the performance of your Prius. Nonetheless, if you need to replace the battery pack on your Toyota Prius and you don’t have the money, this is one option that you may have to consider. Last June, Toyota has announced that it will double the number of hybrid cars in its model lineup. great article.Didnt think the battery replacement was that much! wow! Man, that is expensive! Lets hope I don’t crash mine. Thanks for sharing! This is such an informative post, really learned a lot from it and helped me with my research. I agree, it makes much more sense economically to just rebuild a new battery than to buy one. Our economy is struggling right now and people are always looking for ways to save money, especially when it comes to their vehicles. The price of a replacement battery for the Prius voids ALL the money you may have saved on good gas mileage. We have a 2001 that we would have gladly replaced with another Prius, however after experiencing the price of a replacement battery, we will never recommend a Toyota again. This weekend our Prius reached 113,000 mi and is still going strong. I have heard of instances of batteries going 300,000+ mi. We usually trade-in vehicles every 5 yrs, but we’ll hang onto this one a bit longer. Since there are so many Priii around I’m thinking the cost of replacement batteries will drop anyway. And with fuel prices over $3 per gallon I can save-up for when that day comes. It’s just a planned obsolescence thing, I won’t have to re-build the engine, just the battery. We just need the service industry to change a bit so servicing electric/hybrid vehicles is just as easy as conventional vehicles. When we first bought the car I was intrigued by the new technologies required to run the other systems. Because the car is electrically based it’s a great study and test-bed for other electric technologies. I’m really excited where new solor technologies will lead us. As you’ve mentioned Jonathan, during this challenging time, everyone could use some money saving ideas. Here are some of my thoughts on Prius batteries. In hybrid car another rechargeable battery powers the motor that runs the wheels, it means lot of power is needed; hence high voltage battery is required. Lead acid batteries do not have this property in small package. Most of the car manufacturers have shifted to other type of rechargeable batteries which is practical and durable. Most of the hybrid cars worldwide use nickel-metal hybrid batteries (NIMH). The electrodes used in NIMH batteries are hydrogen absorbing alloy for negative and nickel-oxy hydroxide for positive current. Most of the hybrid cars like Toyota Prius, Honda Civic and Honda Insight use NIMH batteries. The other type is Lithium-Ion batteries which have more power even in smaller packs; these batteries contain anode, cathode and an electrolyte. The anode is carbon like graphite, cathode consists layered oxide of Lithium cobalt oxide or a polyanion like Lithium iron phosphate or Spinel such as Lithium manganese oxide. Electrolyte comprises of non aqueous organic carbonates containing complex of Lithium ions. This is also true that Lithium could be the key in making most affordable hybrids in the coming in years. I think Toyota Prius car is better as compared to the gasoline run vehicles as these cars burn less fuel which means less pollution, but if the batteries are disposed carelessly they create more toxicity and thus damage to the environment. All the batteries have harmful effects on the environment; it is just like trading of chain of side effects. Lead acid batteries are more harmful whereas Lithium is less harmful, nickel comes in the middle. Using cobalt in Lithium batteries, it could create a problem, recycling plays an important role and helps to save the environment. Thousands of metric tons of lead are thrown into the landfills. Recycling of Nickel is still a challenge and is carcinogenic. Today only a small percentage of hybrid cars run on the roads, but once people start using these cars in large numbers, it could be disastrous to the environment; a firm solution has to be evolved at the earliest. I am considering a Prius, wondering if any Prius owners can tell me about its dependability- have they ever broken down or gotten stranded. Also is the gas mileage really over 50mpg? If so then all the time? Thanks for anyone who would like to share their experiences. P.s. I have a Prius also and love it!